This privately owned Estate is set in the lush greenery and unspoiled natural beauty of the majestic Magaliesberg. We offer you a safe environment only 13 km from Pretoria Centre and 50 km from OR Tambo International Airport. Bentley's is the ideal breakaway and has the perfect setting for a wedding, conference, birthday, corporate function or anniversary. Our competent staff will ensure that all your arrangements are done in accordance with your every wish. Ample parking with 24hr security is offered. The Conference Centre houses six, fully equipped, air-conditioned venues. Full day, half day and overnight packages are available. 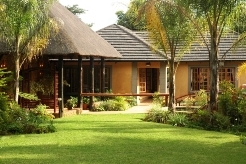 Our 36 luxurious thatched single, double & family hotel rooms open up onto lush gardens. Multipurpose banqueting venues are available for functions & weddings. A variety of menu's to suit all tastes. Our unique thatched stone-faced Chapel, is the perfect venue for that special occasion.